With a population of nearly 50,000 people, Harrisburg, Pennsylvania is a bustling city with a rich, diverse economy. Located at the intersection of Interstate 81 and Interstate 83 and just north of the Pennsylvania Turnpike, the transportation industry has become an important part of Harrisburg’s economy. It also doesn’t hurt that 80% of the country’s population lives within a two-day drive of the city. Harrisburg is also home to a constantly growing healthcare industry, a healthy health and fitness industry, and so much more. But, at the end of the day, Harrisburg’s greatest asset is its people. So what do these nearly 50,000 people have in common? They all need to eat. As you can imagine, Harrisburg is home to more than a few restaurants: Italian restaurants, Chinese restaurants, Indian restaurants, BBQ joints, and so much more. You name it, Harrisburg has it. So how do restaurant owners attract people to their restaurant? How do they separate themselves from the crowd? The answer is simple: image. At the end of the day, the only way to separate your Italian restaurant from the numerous other Italian restaurants in Harrisburg is through image and branding. Of course food is important. Food is what keeps people coming back to your restaurant time and time again. But unless you put butts in the seats, no one will ever taste your food. So it all begins with image. It is how you attract people to your restaurant. People initially come for the image; they come back for the food. 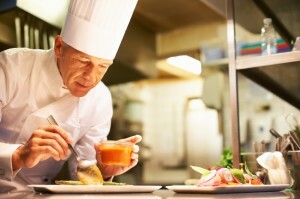 So how can you improve your restaurant’s image? Advertising: More often than not, the first interaction someone will have with your restaurant is via advertising. This comes in many forms, including: magazine, newspaper, radio, television, and Internet advertising. The right advertising campaign can make or break your restaurant. Exterior: No one wants to go into a restaurant that looks like a condemned building. The exterior of your restaurant sets the tone for the entire visit. It is important to have a clean, aesthetically pleasing exterior. Décor: Don’t forget to spend some time on the décor, as well. The décor should reflect the image and feel of your restaurant. It should be aesthetically pleasing and inviting, giving your customers a sense of belonging. Uniforms: Finally, your workers. From the chef to the bus boys to the host/hostess and servers, it is important for everyone to look the part. Remember, anyone can eat at home. People eat out for the professional service, so it is important your workers look the part. For over 30 years, Lord Baltimore has provided top quality uniform and towel rental, microfiber mops, medical garments, and a wide range of additional products throughout Maryland, Washington DC, northern Virginia, Southern Pennsylvania, and Delaware. We will supply your restaurant with uniform rentals that will leave your workers looking almost as good as the food they prepare and serve. Lord Baltimore supplies chef coats, pants, & hats; butcher frocks; cook shirts & pants; aprons; dish towels & bar mops; pocketless & snap garments; and much more. If you have any questions about Food Service Uniform Rental, please contact Joe Bateman at Lord Baltimore Uniform at 800-292-1224 or visit LordBaltimoreUniform.com. You can also follow us on Facebook, Twitter, LinkedIn, and Google+. This entry was posted on Friday, August 30th, 2013	at 12:39 pm	. You can follow any responses to this entry through the RSS 2.0	feed. Both comments and pings are currently closed.